There's nothing better than a bowl of hot bean soup on a chilly day! If you have a crock pot, it's super easy to make while you're at work, or even overnight while you sleep. Add a salad, and a slice of my Sourdough Bread on the side, and you have a dang perfect meal! And, it's cheap! My favorite thing to do is to cook a pork roast, then use the broth and bits of pork to make the soup. The best part is that you don't even have to wash the crock!! You can also use vegetable stock or chicken stock, if you don't have fresh pork broth. Use more broth of you like it soupy, less broth if not. 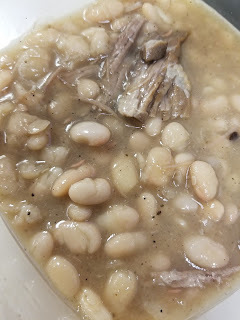 Put everything in the crock pot and cook on low 8 hours or high 6 hours, until beans are done.